A kitchen is a place where you do culinary magic so it should not only store all the necessary equipment and utensils but also give you a chance to freely move in the process of cooking. While decorating this space, you may face many problems. Where to put a massive fridge? Should you buy elaborate wall tiles if they’re hidden behind furniture? And most significantly, how to save money on repairs? A small budget is not a problem if you know exactly what to do. Read this guide and you’ll learn how to decorate a tiny kitchen without spending a fortune on remodelling a few square feet. Before you throw away old kitchen cabinets or repaint walls, it’ll be a great idea to try how your kitchen will look like in a new design. 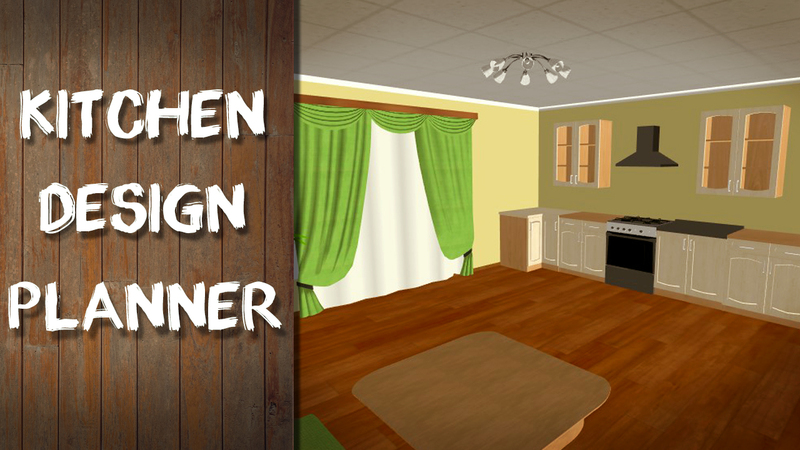 Watch this video and an easy-to-use kitchen design planner in action! If you hire an interior designer to create a kitchen design for small space, it’ll probably cost you a lot of money regardless of the room size. With Interior Design 3D software, you can make as many changes to your room plan as needed without overpaying a designer. The program has undeniable advantages for non-professional users who want to map out repairs in great detail. How to decorate a kitchen on a budget? 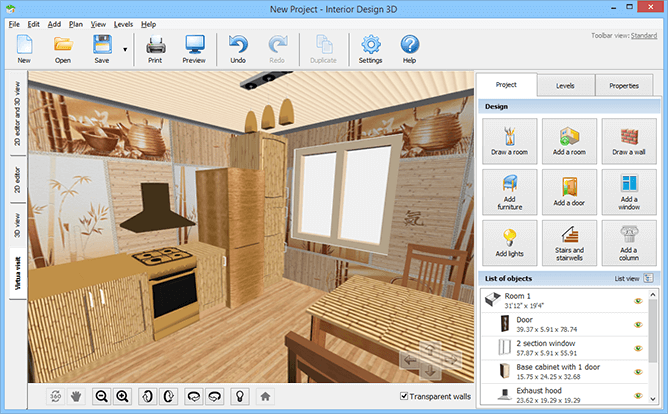 Get started with Interior Design 3D! 🏠 Work with real-life dimensions of all objects. The program lets you manually set the precise length, height and depth of each object and furniture item. Now you don’t have to worry that everything works great on a floor plan but will be a complete disaster once you try to do it in real life. Freely move and rotate furniture until you’re satisfied with the result. 🏠 Use a rich collection of materials and furniture items. The built-in gallery will help you recreate any design idea that has crossed your mind. There are different types of cabinets, tables, stools, wall tiles and wallpapers to choose from. What’s more, all objects from large household appliances to decorative spotlights are easy to customize - try different sizes and dimensions, change the color and covering to your heart’s content. 🏠 Take a digital visit to your new kitchen. There’s nothing worse than finishing your kitchen decoration only to realize that’s not what you wanted. Fortunately, you can have a good look at your design in the 3D view and even take a virtual visit to the newly created room. Make sure that all colors and furniture items fit into the overall interior. Thanks to these advantages, you’ll be able to create a full-fledged plan of your kitchen room and realize it in real life without any critical changes. Interior Design 3D is here to help you avoid many problems and money loss, and get the plan of your dream kitchen. PLANNING TO DECORATE YOUR KITCHEN? So how to decorate a small kitchen on a budget? Are there any more tricks to save money in the process? 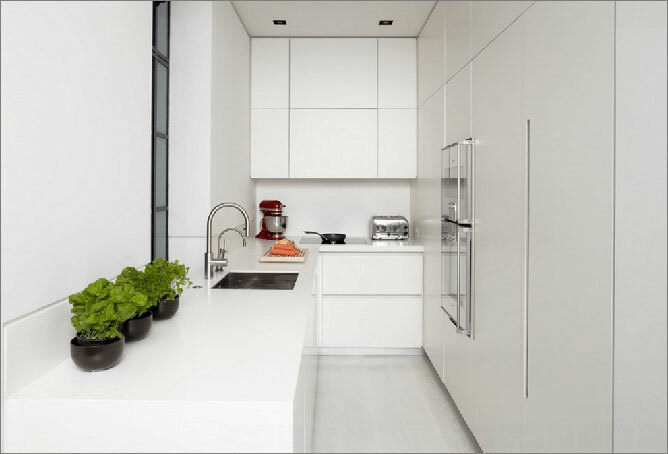 Below you’ll find more practical advice on how to make the most of a small kitchen without crashing its walls or merging the space with adjacent rooms. 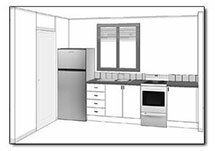 For a start, it may be a great idea to place your ready-built kitchen against a single wall to save a ton of room in an open-space layout. Since every inch counts in a very small kitchen design try using the space above cupboards for storing cookware and other utensils that would give your kitchen a cluttered look. Get creative with seating. You can tuck away a few bar stools under a kitchen island or turn a small bistro table into a larger one to fit more people when needed. While a regular table requires much space and is rarely used for big parties, a foldable one can save you a couple of inches and still give a seat to all the guests. 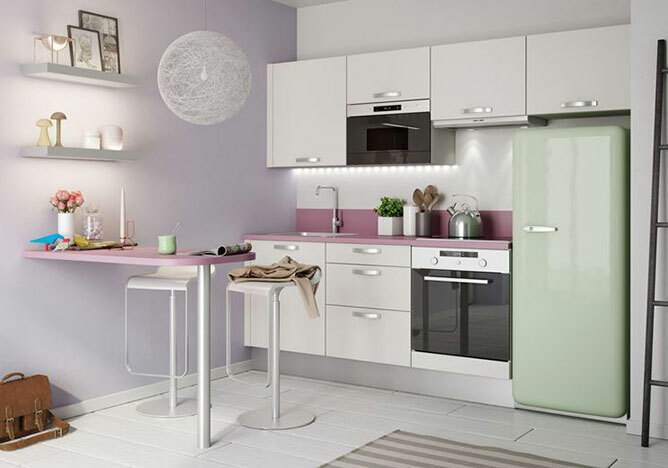 To keep your compact kitchen space open and visually pleasing, spend some time thinking over its color palette. When properly chosen, hues and tinges can visually enlarge a tiny room. For example, it’s best to buy floor coverings and kitchen cabinets that are similar in hue to create a seamless and expansive space. Don’t want to spend hours repainting all the drawers? Do a single wall instead. The trick is to go a little bit darker and add an accent wall that’s two shades deeper than the rest of them. Patterns and prints are one more option to give your small kitchen a little flavor. After you’ve brightened up your walls with a fresh coat of paint it’s time to add light shades. 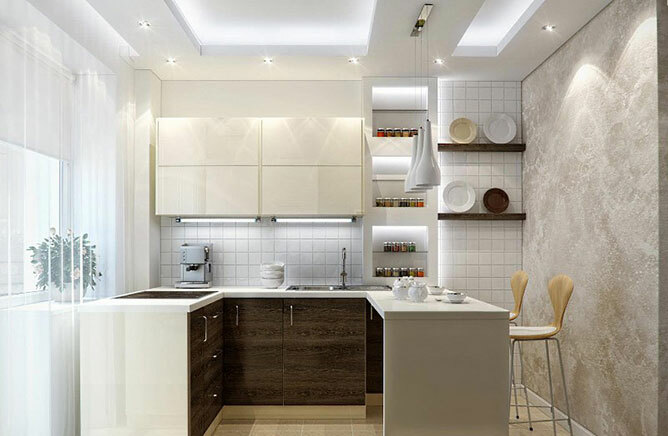 Try using different types of lighting to make your small kitchen appear larger. Under-cabinet LED lighting will brighten the working area and accent your dark cabinets. Choose pendant lights that can be clipped onto existing track-lighting systems to layer the room lighting and give it the feeling of more space. By adding a mirror to a kitchen wall or a mirrored backsplash, you can do a nice trick of reflecting natural light, especially if the window is opposite. Here, we’ve told you how to decorate a small kitchen without spending too much. Feel inspired to change the look of other rooms in your home? We’ve done our best to make the whole process easy and fun for you. Check out these low budget interior design ideas - recreate them in Interior Design 3D before bringing one of these to life!